Description StemRegenin 1 is an inhibitor of AhR with IC50 of 127 nM. 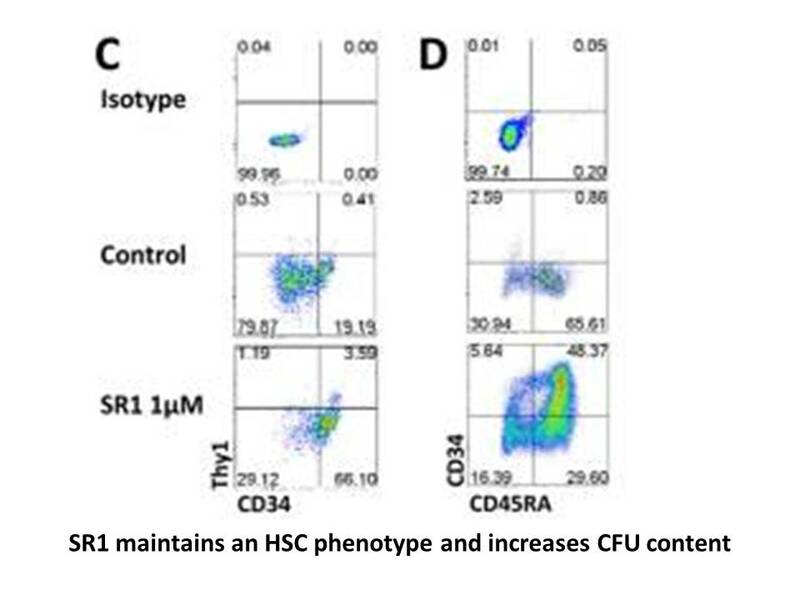 CD34+UCB cells were cultured for 3 weeks with 1μM SR1 or 0.01% DMSO (control). Total cell number was determined at day 7, 14, and 21 and the frequency of pDCs was evaluated at each time point by ﬂow cytometry. During the 3-weeks culture period the total nucleated cells continuously expanded. Analysis of pDC differentiation in time revealed that the maximum frequency of pDCs was already reached at day 14. However, the absolute number of pDCs was highest on day 21. Thordardottir S, Hangalapura B N, Hutten T, et al. The Aryl Hydrocarbon Receptor Antagonist StemRegenin 1 Promotes Human Plasmacytoid and Myeloid Dendritic Cell Development from CD34+ Hematopoietic Progenitor Cells. Stem cells and development, 2013, 23(9): 955-967. 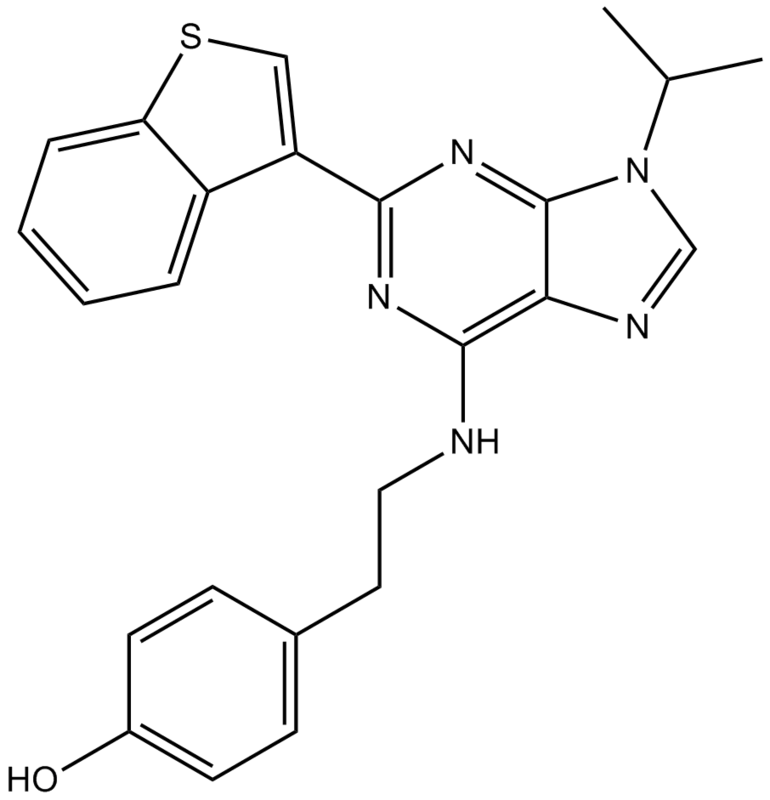 StemRegenin 1 (SR1), a purine derivative, is a potent small molecule inhibitor of aryl hydrocarbon receptor (AhR) that potently antagonizes AhR with a value of 50% inhibition concentration IC50 of 127 nM in CD34+ cells. SR1 has been found to promote the ex vivo expansion of CD34+ cells. 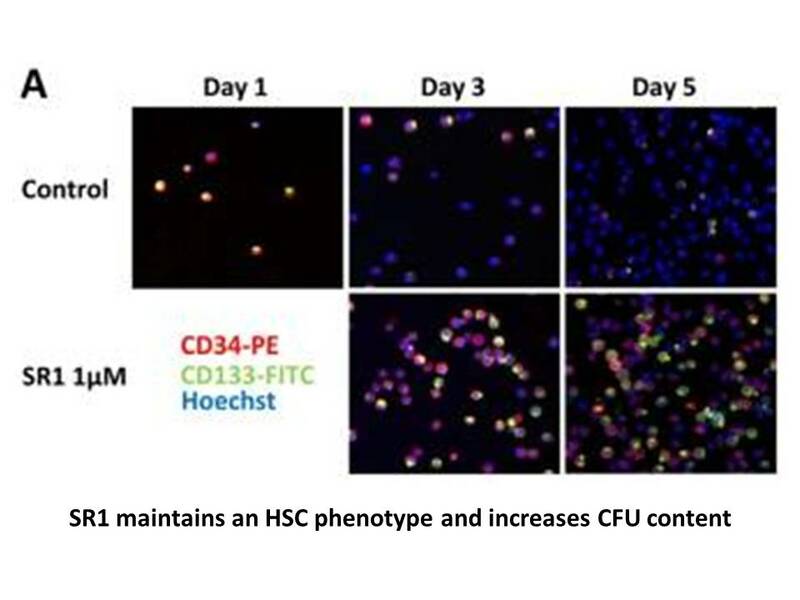 Recent study results have suggested that culture of hematopoietic stem cells (HSC) with SR1 increases cells expressing CD34 by fifty-fold and increases cells retaining the ability to engraft immunodeficient mice by 17-fold. SR1 has also been found to induce the ex vivo differentiation of pDCs, BDCA1+ and BDCA3+ mDCs as well as the generation of high numbers of all these DC subsets. Boitano AE, Wang J, Romeo R, Bouchez LC, Parker AE, Sutton SE, Walker JR, Flaveny CA, Perdew GH, Denison MS, Schultz PG, Cooke MP. Aryl hydrocarbon receptor antagonists promote the expansion of human hematopoietic stem cells. Science. 2010 Sep 10;329(5997):1345-8. doi: 10.1126/science.1191536. Epub 2010 Aug 5.